There’s a popular statistic that bounces around the nonprofit industry. 90% of donations come from 10% of donors. Although the percentages will vary slightly according to who is relaying the statistic, the underlying relationship is certainly true. For most nonprofits, major gifts are the lifeblood of their fundraising. Small and mid-level donors are very important, but one big major gift can be a game changer for an organization. It’d be great if nonprofits could just stumble onto those major gifts, but they do take work to acquire. With the right plan and program in action, however, raising funds from major gifts is a reasonable goal. There’s no quick trick to major gifts. No ruby slippers waiting for three heel clicks and a wish. Luckily, we’ve got the next best thing—a step-by-step guide to launching a major gift program at your organization. Create a solicitation strategy and begin. A major gifts program is a major endeavor. It will need the support of organizational leadership to succeed. The program will be crucial to the overall progress of your fundraising. It is imperative that leadership understands that and is willing to not only support, but champion, your aims. To get your leadership on board, make sure that you explain the importance of your major donors and how this program will help you gain more major donors and retain supporters. With high-value donors like the major gift prospects that you’ll be soliciting, organizational leaders will need to step in occasionally. Sometimes donors want to, and will respond better to, being asked for donations by an executive director, for example. A well-run major gifts program is an all-hands-on-deck affair. You are going to be after the big fish, so to speak. Really, the biggest fish possible. Consider hiring a specific major gifts officer to be the program’s leader as well. With your new team in place, you’ll be able to get started with the nitty gritty of developing and implementing your program. When forming your team, encourage involvement by highlighting what the major gifts program can accomplish and what each team member’s role will be. You can’t have a major gifts program if your staff does not have a clear sense of what amount constitutes a major gift. The great thing about major gifts programs is that a large, national nonprofit can have one and a small, local nonprofit can have one as well. With that being said, I’d wager that the threshold for what qualifies as a major gift at the national organization is going to noticeably exceed the threshold at the local organization. You’ll need to analyze your nonprofit’s donation histories and averages to determine what the major gift magic number is in your specific scenario. Although it is by no means a hard and fast rule, for many established nonprofits that number is around $5,000. Perform a prospect screening of your current donors and prospects to determine who on your list is a candidate for your major giving program. Keep in mind that you’re looking for two main qualities in your major giving prospects. The right combination of those two factors is going to determine the likelihood of that individual joining the major gifts program. A major gift is going to be a substantial amount of money, both for your organization and the individual who is parting with it. Major donors are contributing generous sums to your organization. They want to see that their funds are going to specific things with tangible results. They are just like any other donors in that they want to see a cause and effect. Major gifts donors want to affect change. We’ll break this idea of tangible outcomes into two categories to better explain it. Incentives never hurt. Major giving is an exclusive club, so ensure that your donors are recognized for joining. Equally important to encouraging program involvement and growth is how you communicate the results of these major gifts. Major gifts can truly make things happen for an organization. The people providing those gifts deserve to know exactly what they’re accomplishing. Donors are also more inclined to give if their funds are going to something that is predetermined, rather than, say, a general operational fund. Within your major gifts program materials, outline a set list of goals to accomplish with the acquired funds. Once your program is established, include a list of program outcomes and reached goals. Let donors rest assured that their funds are going to make a big and direct difference. You’ll need to know what these tangible outcomes are as you move onto the next step: strategizing and starting. Earlier in the process you put together a dream team. This step is the time to pull your players off the bench. Show them the plan, give them a rousing speech, and send them into the game. Let prospect research guide this strategy. You already know your major gift program donation threshold. Some participants will be right at that number and others will have the capacity to go way over. Accurate and well thought out asks are going to be the best way to get the most out of your major gifts donors. Have your prospect researchers put together profiles on your candidates with recommended asks. Then divide the profiles among your fundraisers. Your fundraisers can work in conjunction with your board and marketers to create the ultimate presentation for each of the prospects. Your program will not survive for very long in the wild without an excellent stewardship program. Major gift donors are like gems — rare and precious. Knowledge of that should drive your interactions. The program perks section of step five should be part of this stewardship program. Much of stewardship goes back to acknowledgement. Donors need to be and deserve to be thanked. The good news about the relative scarcity of major donors is that when you acquire new program members you should be able to give them personalized and customized attention. Your communications with these donors need to go beyond the standard strategies. Take the time to really get to know them. Find creative ways to recognize them. Send them thank yous occasionally throughout the year, even when they haven’t donated recently. Correspond about topics outside of asks and acknowledgements. It is vital to the program’s success that your gifts officers, board, and leadership cultivate true connections with these donors. Make sure they are invested in your organization and your mission. On a periodic basis: evaluate your results, isolate areas of improvement, and take those areas into account when you start your next major giving campaign. 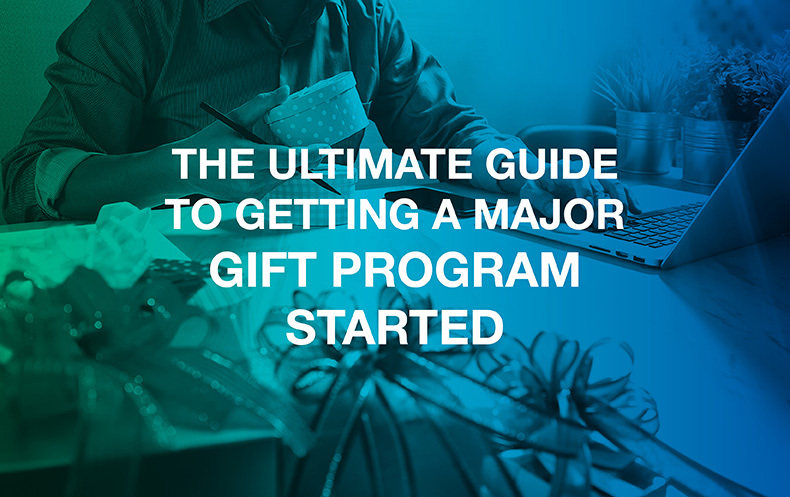 To get a full understanding of your major gift program’s success, you’ll need to compile the information from your constitute profiles as well as your fundraising software. If you’re also using a tool to conduct prospect research and maintain your major gift program, that information also needs to be culled together to get a full picture of your progress. Launching a major gifts program may seem overwhelming, but just one of those large checks can make all the careful effort worth it. Prospect research is going to be a major factor in your organization’s ability to start and sustain a major gifts program. Major Gift Officer Job Description: If you’re considering hiring a major gift officer to help create your major gift program, this job description can help determine what to look for. Major Donor Fundraising Strategies: For more ways to raise money from your major donors, check out this list of proven strategies. 3 Ways to Determine Major Donor Giving Capacity: Using wealth screening and prospect research is a great way to learn how much your major donors can give. Learn about three other ways can determine a major donor’s giving capacity.